Raidious was featured on Mashable today. For those not in the know, Mashable is a pretty big deal on the internet. Taulbee Jackson and I were interviewed last week for this story on our Social Media Command Center for this year’s Super Bowl. 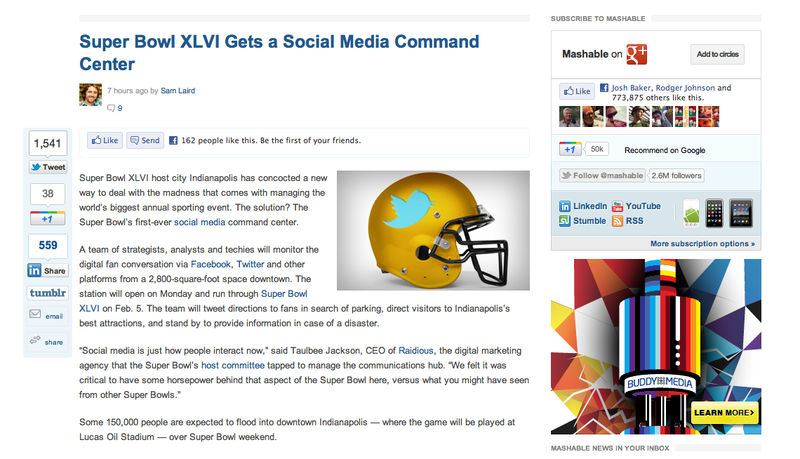 Read “Super Bowl XLVI Gets a Social Media Command Center” on Mashable. The Raidious team has done a great job gearing up for the next two weeks in the past two years. I’m glad to work with such amazing folks every day. I’ve wrapped up a couple of projects this year (most notably Thin Fevers) and begun the ignition sequence for a few new projects (a new band and a comic book to start) all while keeping things rolling at Raidious. July brought our company it’s second anniversary, and we’ve learned a lot and had a lot of success. I am continuously flattered by the talent that I get to work with and the great things our customers and colleagues have to say about us. We launched Raidious Control in March. As I mentioned, Thin Fevers is no more, but I am happy to say that I am involved with a new music project, details of which will be coming soon. I’d like to extend my sincerest thanks to everyone who ever came out to see Thin Fevers, and all of the great folks that wanted to see us, but couldn’t. I’ve got audio of our last show, once it sounds good, I’ll be sure to post. Also, I just welcomed my second son home, so I will be watching that new Will Arnet show. How to Use Google Apps to Improve Your Business, featuring me! Well, this is a bit dated – but I’d like to post this for posterity. Back in June, the interactive marketing agency I work for (Raidious) received a call from Inc.com’s J.J. McCorvey. J.J. requested an interview with us about our use of Google Apps for business, and we were flattered. Check out the article. I was glad to have the opportunity to geek out about such a great suite of tools. Thanks to Taulbee Jackson for being on the call with me, and for being a good sport when a couple of his statements were attributed to me. Things at Raidious are never dull. We are currently working on a project that involves an interview with Indianapolis Colts player Pierre Garcon. Matt Chandler was kind enough to put together a behind the scenes video and blog post detailing the day. I have a brief cameo at 00:15. Enjoy! 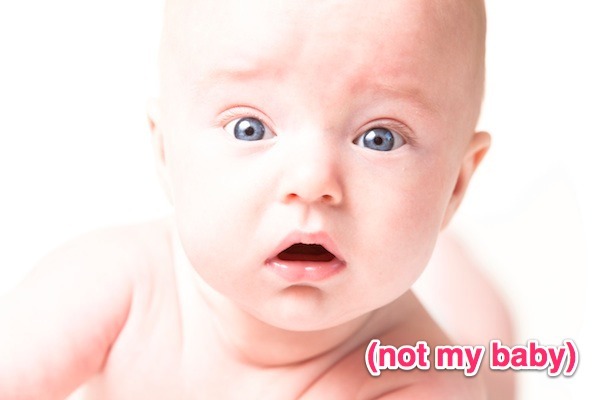 I wasn’t sick – I worked there. Since 2003 I had been under the employ of Community Health Network. As a member of the Business Development Division’s e-Business team, I saw my role evolve from web designer to Director of New Media. It was a great experience – professionally I met bounds of great people and learned a lot from both team members and leadership. Personally, I started my family while working there, and enjoyed the friendship of a great work family. I would not be where I am today without that experience. I now find myself as Vice President of Operations at Raidious. I could not ask for a more perfect opportunity: I am working with a great team in an exploding field, I get to wear jeans to the office (when I’m there), we all use macs, and we have an office downtown. In my new role at Raidious, I will get to do what I do best: put the pieces together. The past three months have already taught me a great deal about what it takes to build a company, and what it takes to deliver great work. We are not only starting a new company, we are inventing a new business. Building a company doesn’t leave much time for other pursuits, including updating my own website apparently. I still have some personal projects in the hopper, but I will be closing off some others. It is my noble intention to keep this site updated with progress on all things big and small in 2010. Raidious – Raidious will be creating some amazing things in 2010 for some amazing companies, subscribe to the company blog to get lots of updates on what we are doing and how we do it. Music Videos – I had started a series of posts on making a music video, but the project stalled shortly after. I will be publishing my second and last post in that series as a bookend to the project, perhaps to be picked back up at a later date. I am still working on another music video project, with a time-line yet to be determined. iPhone Apps – I cannot stop thinking of ideas for iPhone and now iPad apps. A colleague of mine and I have some cool stuff in the works – stay tuned. I did, however, help launch the Standard Recording Company’s new iPhone app. You can download it here. RockitBomb.com – RockitBomb is pretty much over. I may do some mixes or quick episodes again someday, but don’t expect much. RockitBomb.TV was a great pilot project, but is being shelved to make room for work that keeps food on the table. You can catch old episodes of the podcast in the RockitBomb category on this site, and watch some of the video shot for RockitBomb.TV on my vimeo channel. Thin Fevers – We are still working on new material. Expect to hear some new stuff in 2010, or at least one new song. We recently released some new material for free, and we are currently working on new stuff.